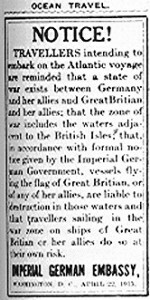 Imperial Germany Embassy advertisement, Des Moines Register, 22 April 1915. The Second Battle of Ypres commences as German soldiers launch a major assault on French, British and Canadian troops in northern Belgium. The German Fourth Army releases a green cloud of poisonous chlorine gas. Lacking any protection, the Allies quickly retreat. The German infantry advance behind the cloud is rapid, the Allied Front Line is broken and the way to Ypres is secured by the end of the day. Fighting continues until 25 May. This entry was posted on April 22nd, 2015.